"Sometimes to get more out of life, you have to make more of yourself." 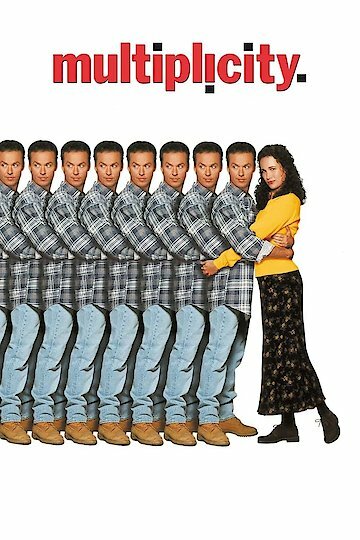 Multiplicity is a 1996 comedy movie. Doug, played by Michael Keaton, is a construction worker who is always busy with his work, and never has time for his family. Doug meets up with a scientist to help him with his troubles. The scientist in turn, clones him to help him with his daily responsibilities at home and at work. The clone he makes will help out at work. Two, (the name of the second clone) does a good job at Doug's work because the clone has the memories from Doug, which makes it easier to fill in for Doug. Two gets lonely and wants some company. Two, then ends up cloning himself, so altogether there are three clones of Doug. Come to find out that each clone that is made is a weaker replica of the original. Doug proclaims that no more clones will be reproduced from this point on. Doug realizes that the clones are getting in the way of his relationship, and free time. His wife starts to scratch her head because she sees Doug isn't himself lately, and changes personalities often. Doug is keeping his clones a secret from everyone, and doesn't want his wife to catch on. One day Doug leaves town for business, and when he returns he finds out that Two got him fired from work, and his wife left him and took the kids. Doug has to come up with a solution to get his wife and children back. Since the clones got him in this mess, then the clones will help him out of this predicament. Doug remodels the house in hopes of getting his wife back. After he gets his wife and children back, then it is time to say goodbye to his clones. After they leave, we find out that the clone's lives still go on. At the end of this movie, we see that all of the clones find employment and happiness in Florida. Multiplicity is currently available to watch free on IMDB Freedive and stream, download, buy on demand at Amazon, Vudu, Google Play, iTunes, YouTube VOD online.